If you were lucky, and happened to be driving along a winding country road just outside Franklin last year, you might have witnessed a bizarre display of antiquing unfold in David Pickartz’s front yard. One by one, David dragged claw-foot bathtubs out of his barn, and deposited them at the feet of his wife, Bonnie. Once the trio of vintage fixtures was in position, Bonnie, like Goldilocks searching for the one that was “just right,” proceeded to climb into each and give its level of comfort careful consideration. With all their merits weighed, she pronounced the winner: an auction find that had made the move with the couple from Houston 13 years earlier. Today, it graces the first-floor washroom of their newly finished timber-frame home. Elements of Bonnie and David’s backstory may ring familiar: Before relocating to Western North Carolina, they were nearing retirement, and looking for a scenic spot to build a rustic dream retreat. “Houston was where we made our living, but not where we truly lived,” says Bonnie, though a move to the Blue Ridge Mountains wasn’t yet in their thoughts. The couple’s original idea was to build a log cabin on the White River in David’s home state of Arkansas. But their plans took an eastward shift. In 1997, David left his job at a fiber optic company in Texas to start an apprenticeship with Goshen. Already a natural woodworker who’d learned some skills from his dad, David excelled, and the company’s owner asked if he wanted to work full-time in the business. David called Bonnie and posed the question “Would you move to Franklin?” Her response was quick: “I’m packing now.” The couple came to town and set about learning the timber-frame business. They eventually bought Goshen, and these days Bonnie works with clients on designs, David leads the building team and apprenticeship program, which draws students from across the globe. One of their sons, Gerald, handles the 3-D renderings. And the combination has proven successful as Goshen homes can be found as far away as Washington state. Rather than going big, they went moderate at 1,699 square feet—an option they encourage clients to consider. “Sometimes people tell us ‘We’re downsizing, so we only need 3,000 square feet,’” says Bonnie with a laugh. “Then we invite them over to see our house.” Most people immediately recognize that the home feels larger and grander than its footprint suggests, thanks in part to the ceiling that reaches two stories, where graceful arched beams meet. Two bedrooms suites provide ample space when there are additional living areas, including an office and reading nook that overlooks the great room. The mix of furnishings complete the cozy picture. Around the well-worn wood dining table they picked up at one of any number of auctions (Bonnie’s visited too many to count) is a variety pack of chairs. Like an eclectic group of friends at a dinner party, the sleek, low-backed mid-century school chair doesn’t mind communing with the ladder-back that sits at the head of the table. “A house should be filled with things you bought because you love them,” says Bonnie. “Furnishings should be an adventure.” She’s been known to share this ideal, along with a few pieces of furniture, with many Goshen clients over the years. In fact, the old dining room table has already been sold to a couple whose home is under construction. And the two claw-foot tubs that lost Bonnie’s backyard comparison test have since been refinished and started new lives as fixtures in homes David built. Each is a very personal touch on par, in style and quality, with the hand-sawn timbers at the core of the homes they create. For Bonnie and David, selling the dining room table means going on another adventure to the auction to find a replacement. And who knows, they might find a few more bathtubs for their barn along the way. Building a home’s frame without nails certainly holds a level of cachet among buyers who are looking for rustic simplicity and an exotic bragging point, but it’s far from a new concept. David and other timber framers have made their careers employing a construction method that takes its roots from ancient Egyptian furniture-makers and shipbuilders. History suggests they may have been the first carpenters to use mortise and tenon joinery. 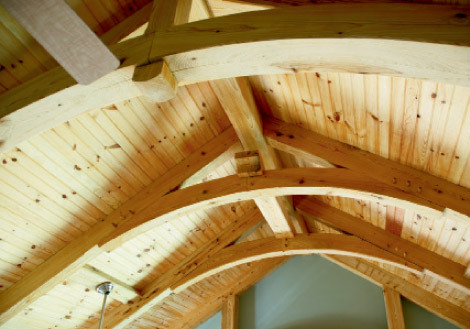 In timber framing, the simple system connects wooden beams at an angle by slotting a protruding piece that has been cut at the end of one timber (the tenon) into a receiving slot (the mortise), which has been carved into the other piece of wood. It’s perhaps the simplest type of joint in woodworking and serves as the basis for hundreds of variations. “Once you connect all the posts and beams this way, the timber frame supports itself,” says David. The fact that the structure is made of tightly interlocking pieces prevents the beams from shifting out of place. “When you look at the joints we build, you’ll see that there are wooden pins, or pegs, holding some of them together. They’re actually there to keep everything stable when we’re assembling the building,” he says. “But once the house is built, I could hammer all the pins out and the structure wouldn’t budge.” Though he admits that he keeps the pegs installed in his own home for instructional purposes since it often doubles as a showhouse. At the company’s workshop in Franklin, David and his team of 10 employees plus apprentices create a computer-generated architectural drawing of the client’s home. With that, they’re able to plan how each post, beam, corner, and roofline will join together. “From there, we know exactly how many timbers we’ll need and where each mortise and tenon will be placed throughout the entire house,” says David. His carpenters then cut and carve each piece of wood by hand before test-fitting each component on the workshop floor—a crucial step in the process since timber framing requires such precise joinery. Once it’s assured that every piece of the puzzle fits, the frame is disassembled, loaded onto a truck, and shipped to the construction site. After the timbers arrive, it takes less than two weeks to assemble the structure and install the highly insulated, prefabricated panels that will become the home’s outer walls. The time, from design to move-in, is about one year—not bad, considering it was a few millennia in the making.